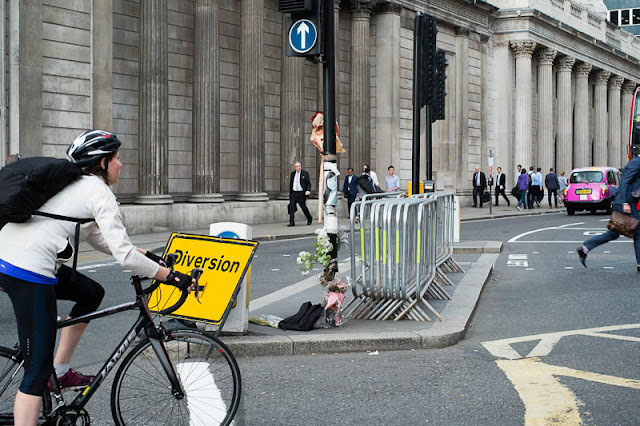 The flowers and photographs on the traffic pole are a memorial to another cycle death in London. Ying Tao a 26 year old woman was killed on her way to work on a Monday morning in June this year. She was the 8th cyclist killed this year. Last year over 5,000 cyclists were injured or killed on London's roads. Many the result of left turning vans and lorries. There is a growing movement to ban these vehicles from inner city roads during rush hour traffic. Today London's roads will be free from traffic as thousands of bikes partake in free cycle, an annual event where cyclists of all levels can freely cycle around the city in safety. See other interpretations of the City Daily Photo theme day "bicycles". We have "ghost bikes" painted white as memorials to killed cyclists that pop up occasionally here in our city. Good to have a day when cyclists are honored and safe. It's dangerous enough to drive in London, I wouldn't chance a bike. But, I must say you did an expert job when I was visiting there. The "free cycle" event is fantastic. That I would do! I suspect that within the next 50 years, the centre of cities will be reserved for bicycles and pedestrians during the day, with all deliveries being made only at night. The sort of death toll you describe here is intolerable. I would be terrified to ride a bike in London! Today would be a good time to try it though - love the route of the free cycle event. Ghost bikes tend to crop up here as memorials. It must be freeing to ride when the streets are closed to car traffic. There's some poignancy even amidst all the free-spiritedness of cycling. That's tragic Chrissy.. I now personally know the feelings of sadness when a family member is taken by careless driving. A sad reminder of how dangerous cycling can be. Let's hope there are no more tragic deaths here.